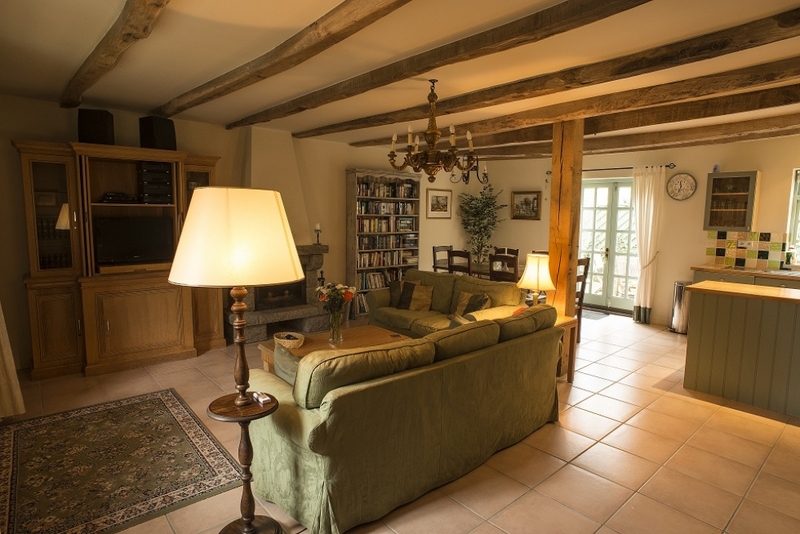 Our two-bedroom gite with heated swimming pool, Hirondelle, is ideal for families, friends or couples, and it sleeps up to 5 people in comfort. Hirondelle was originally an apple store and cider-press (“pressoir” in French), and its charm and character shines through its tasteful refurbishment into a warm and welcoming two-bedroom gite in the heart of Brittany. It was built around 1880 and is approximately 79 sqm in size. It has been decorated for family comfort and relaxed convenience. Hirondelle is charming, comfortable and very well equipped. Everything you need is here. On the ground floor: living / dining room with fitted kitchen. 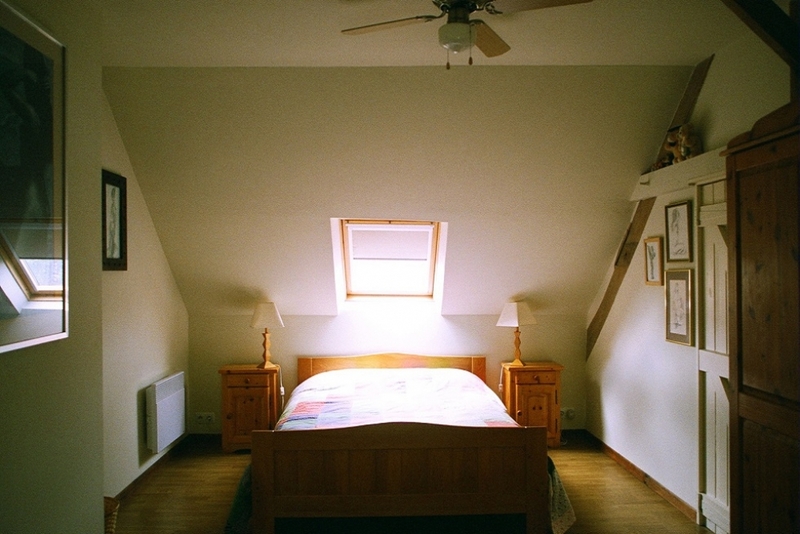 1st floor: a bedroom with a double bed and a single bed. A room with 2 single beds. A bathroom with WC. 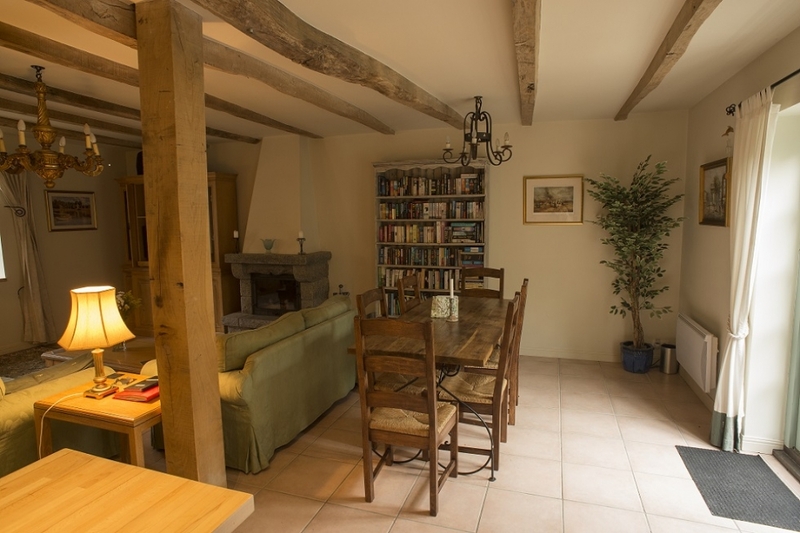 The kitchen, living/dining area is open plan with an impressive stone fireplace with an inset wood burning fire. Living area has two large comfortable sofas, coffee and lamp tables, English TV (Free Sat) DVD player, CD/stereo system, and a selection of books and games. French doors lead to a private patio behind the house. Hirondelle has a private patio to the rear which gets the sun for most of the day. It has a barbecue and a table and chairs to sit and relax and enjoy the Breton sun. It’s a favourite feature of Hirondelle. 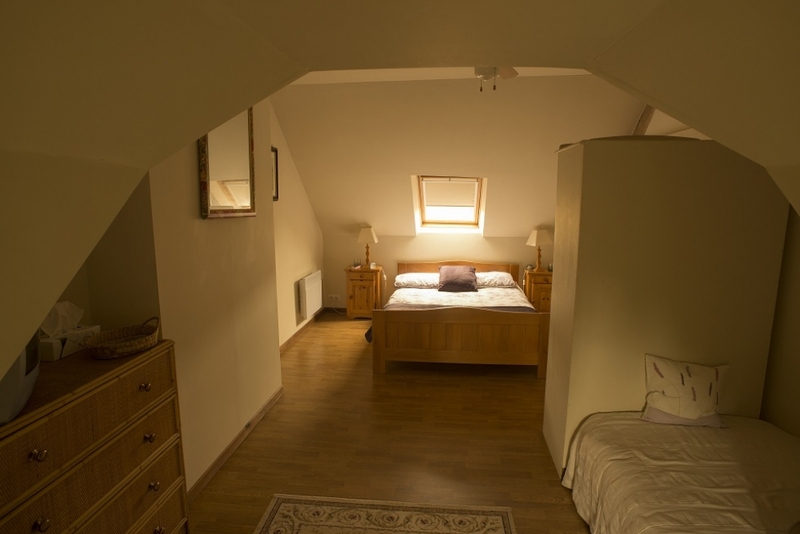 The staircase to first floor leads to a large bedroom with double bed and single bed. These areas are partially separated by the double wardrobe. There is a TV with DVD and a ceiling fan, and there are windows at both ends of the room. The second bedroom has two single beds, a small wardrobe and a chest of drawers. The family bathroom has a WC, basin and a full bath with a shower fitting. The safe, secure heated swimming pool is a much-loved feature of our gites. Nothing tells you you’re on holiday quite like starting the day with a splash or having a quick dip last thing before supper. 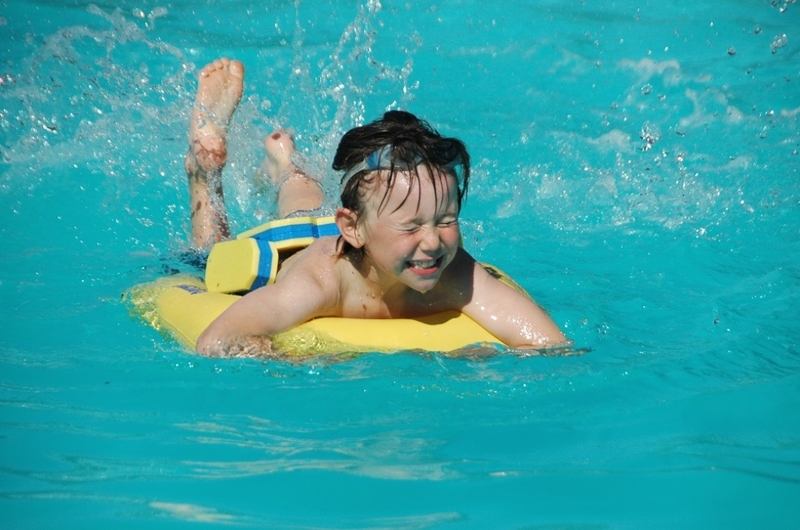 The pool is a firm favourite with all ages and a huge hit with the kids, in particular. Parents love being able to put their feet up on a sun-lounger or read a book under an umbrella while the kids splash around in the pool. The pool is solely for the use of our guests in Les Moulins, Hirondelle and the Studio so it never gets crowded or too busy. The pool is in our secluded garden, behind Les Moulins. A tall laurel hedge gives great privacy and security and it allows our guests to swim or sun-bathe in peace, privacy and comfort. The pool is open and heated from mid–May to mid-September. 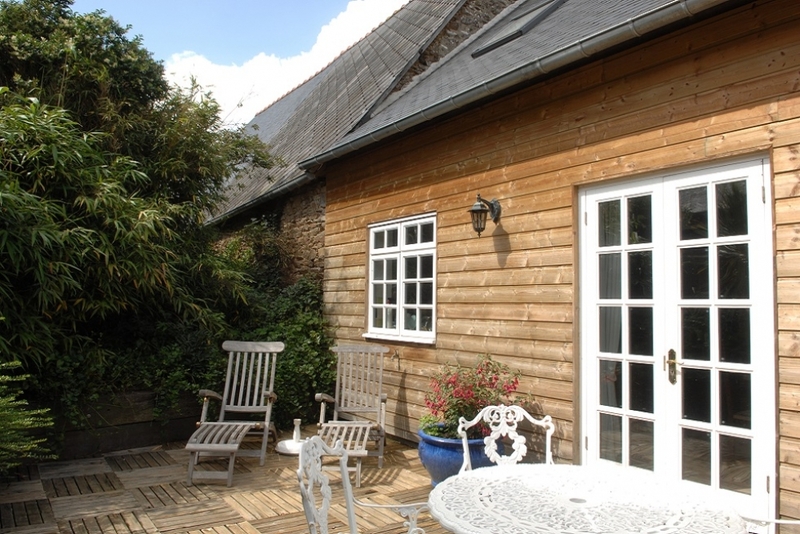 One of 3 holiday homes to rent with heated pool in Saint-Ouen-La-Rouerie, Brittany, France. 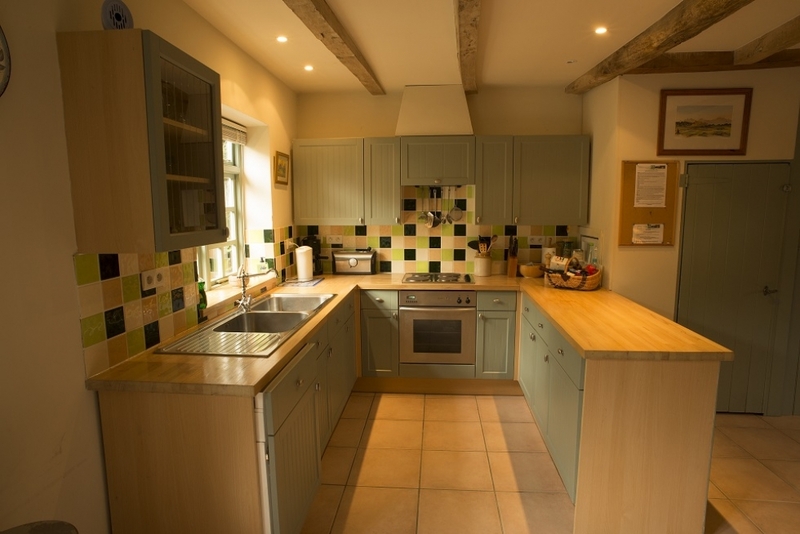 Hirondelle, is ideal for families, friends or couples, and it sleeps up to 5 people in comfort. English TV (Free Sat) DVD player, CD/stereo system, and a selection of books and games. Free wi-fi is available in all three gites and at the poolside so you can stay connected if you have to. Wired connections are available in Les Moulins and Hirondelle. The wireless signal covers most of the house but thick walls mean that the signal is strongest on the ground floor. A covered carport with a space reserved for each gite means you can have a relatively cool car in sunny weather. Other off-street parking is available too. The boules pitch alongside the drive is good fun for all the family. Kids love the novelty of it and adults can get uncharacteristically competitive. The accepted wisdom has always been that everyone is much better at boules after a drink or two. Who are we to argue with that? Bicycles are free to borrow in a variety of sizes from child to adult. Some helmets are available. There are many quiet country roads around the area which are ideal for a spin. A cot, travel cot and high chairs are available on request. We can arrange stair gates on all the stairs and door gates for the bedroom if you have very small children. Please let us know what you need and we will have everything ready for you when you arrive. Folleville is ideally located for so many different types of attractions. We are also situated within easy distance of beaches, cities and so many attractions. You may wish to take a trip to Mont St Michel - An ancient monastery, on a fortified island, just one kilometre from the mainland, Mont St Michel has fascinated visitors for hundreds of years. As a fortress, it appeared to have everything. Easily accessed across the sand when the tide was out, easily defended when any besieging army would have to withdraw or drown at full tide. The island is about 100 hectares (250 acres) in size and its population in 2015 was 50. Every year, more than 3 million visitors cross the sands or take the new bridge to visit the commune. It’s a truly unique experience and it’s less than half an hour’s drive from our beautiful holiday gites. Ask us about many other options for fantastic day trips in the area. There is so much to do and see in this most beautiful part of France. Don’t forget, you can always forget about exploring and adventures for a while and spend the afternoon at our beautiful heated swimming pool. Sometimes it’s nice just to take it easy!